Living in Chiang Mai, I am constantly treated to spectacular visual beauty, thanks to the hundreds of temples and religious activities which regularly occur here. Any given morning, en route to work, I get to see people praying to monks and offering alms to them to bring back to their respective temples. 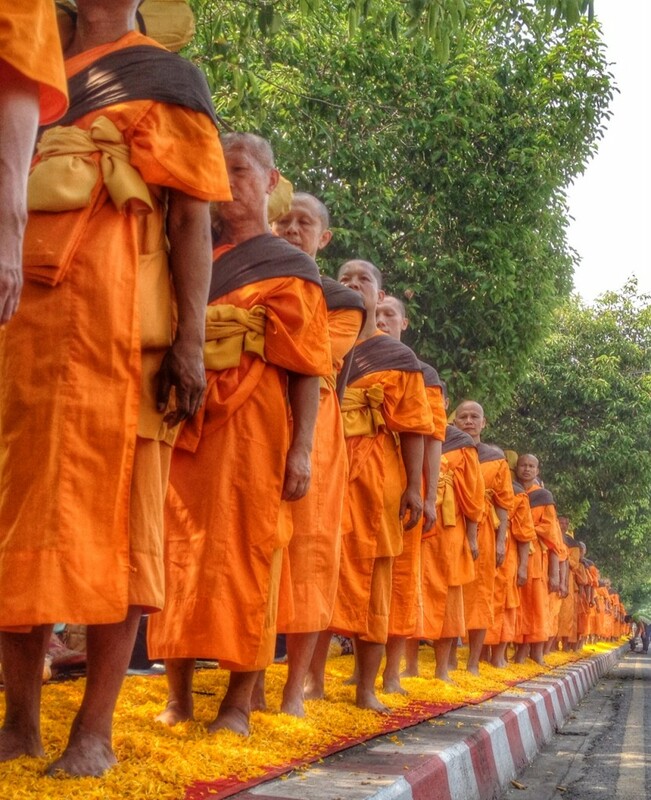 The first of 500 Dhutanga monks enters the shot. 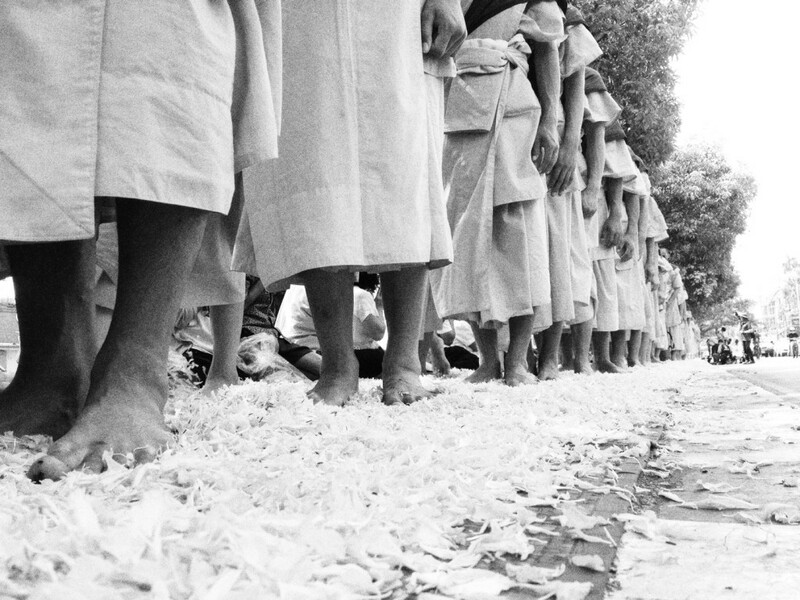 In fact, today (April 9), is a very special day for Chiang Mai. 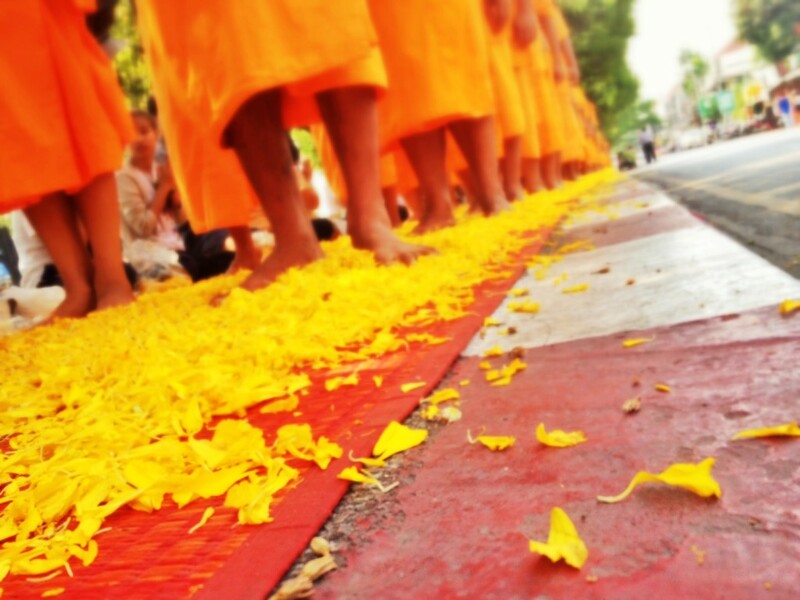 Today, 500 Dhutanga monks came to offer reverence to Buddha’s relics. Beginning at 9 a.m. at Wat Phra Singh, the monks started their procession through the city, along parts of the moat and into markets, ending at Wat Chedi Luang Woraviharn. 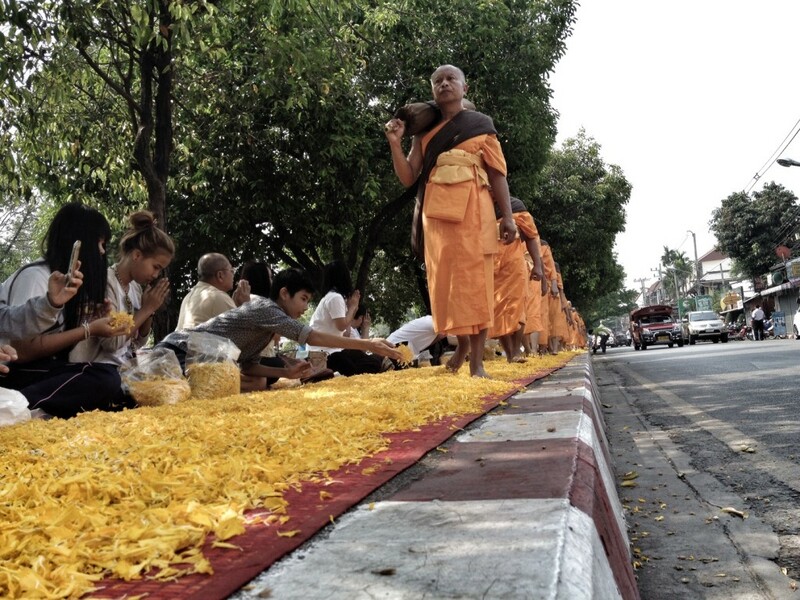 Locals line the moat near Thapae Gate with flower petals and await the monks. 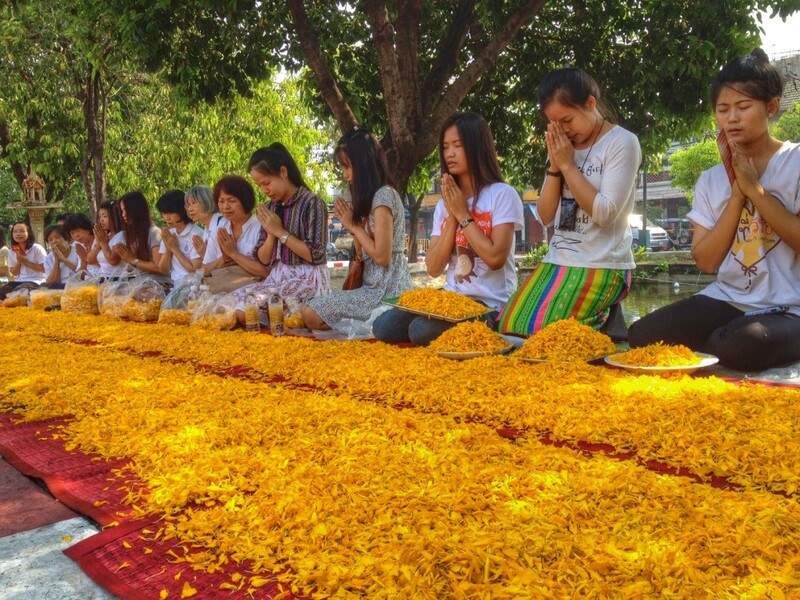 There is something quite awe-inspiring seeing 500 monks, clothed in orange, walk a top a sea of yellow petals while people pray. Truly a beautiful experience. 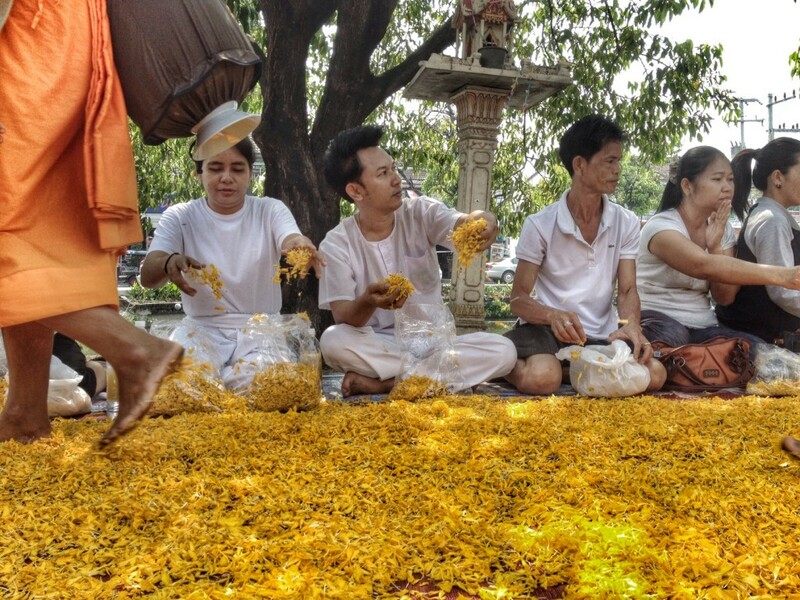 This special day falls a mere few days from the most well-known event in Thailand — Songkran. In just three days (although the official start of Songkran is April 13), the city will turn into a massive water fight zone. This looks amazing – the colours are so spectacular. What a beautiful ceremony! Thank you, Erin. It was a really cool event. Okay I’ve just spent the past two days binge reading your blog! I have basically just done what you did in the beginning – a month after turning 30, I took a deep breath, made some big decisions and gave everything at home (Australia) up to move to the UK so that I can explore and adventure across here and Europe. I’ve loved reading all about your jaunts and now I’m even more excited to start my own trips around EU. And now I’m thinking about Thailand eventually, you’ve inspired me! Awww! That is awesome! I love this!! Let me know if you come here!! It was really cool to see it live! Berlin is one of my favorite spots!! Asia is incredible — let me know if you are heading to Chiang Mai!